Five Unique Ways to flaunt Happy Feet! Toes play a very crucial role when it is about balancing the whole body. Without these ten little fingers, you cannot walk or stand properly. It is absolutely crucial to take care of your toes. Though they are the most neglected part of your body, they contribute a great deal to the proper functioning of your leg and feet muscles. By maintaining a simple toe-care routine, you can ensure your muscle strength and can have a better balance. Here are some exercises for your toes that can keep your feet healthy. 1. Toe-tapping exercise :You certainly have tapped your fingers on your office table while waiting for your boss to arrive. Tapping fingers bears a sign of impatience but when you do the very same thing with your toes, it can give you ample benefits. All you need is to stand on a smooth surface barefooted and stretch your toes upwards so that they do not touch the floor. Then just as you do with your fingers, start with your small toe and end with big one in a waving motion. Repeat ten times at a stretch. Doing this exercise on a daily basis will strengthen your toes and feet muscles. 2. Choose the right pair of shoes: Always sport toe-friendly pair of shoes that will let your feet breathe. The more air goes into your shoes, the healthier it is. If you wear toe covered shoes, it causes your feet to sweat and that results in fungal infections called Athlete’s foot. So follow this advice to keep your toe-skin in a good condition. If you are more comfortable in pump-shoes or ballerina, then make sure that it allows your feet enough space and your toes are not curled up inside. Knowing the right size of your shoes holds a lot of importance when it comes to maintain a god health of your feet. 3. Big toes down : Try to stand on your feet without using your big toe! Difficult, isn’t it? Yes, big toe does the balancing act when you are in motion or just standing on the ground. If you are an athlete, then your feet and legs are your only tools that you use to pursue your passion. Just a simple toe exercise can lend you strong and smart legs. Stand up tall and lift all your toes up. The rest of your feet should be touching the floor. Now lower you big toes and put them on the floor keeping the other eight in the previous position. Repeat 8 times per day for maximum benefits. 4. Towel crumpling: Spread a towel on the ground and crumple it with the help of your sole and toes. It is an effective workout that loosens up your toe joints. You must repeat it several times for complete result. It also stimulates the acupressure points under your sole which relaxes your muscles and ameliorate joint pains. Do it regularly and enjoy the benefits. 5. Massage your toes: If you have hammer toes, no need to go under knife now. Simply by massaging your toes you can get rid of this annoying problem. Though it does not interfere with your functionality, but it will certainly spoil the beauty of your feet. Sit cross legged on a chair and hold your hammer toes with your fingers. Now stretch it back and forth slowly holding each pull for several seconds. 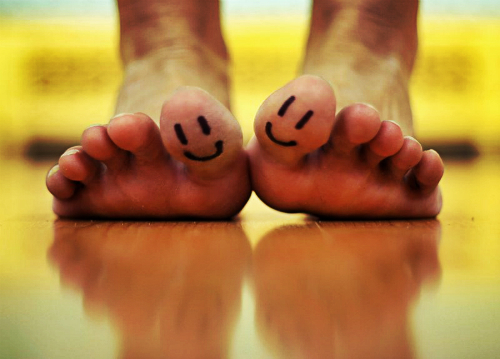 This way you can relieve your toe muscles and improve blood circulation on your feet. These abovementioned exercises are the easiest methods to keep toes and feet in a superb condition. Try out these sweet pampering sessions at home. Devote few minutes to your toes and feel the difference! ← Jennifer Lopez Gets A New Body At 44, Loses 10 Pounds – Can You?